Come and climb with us to the Top of Europe - Mt. Elbrus (5642 m)! - saturday to saturday, startinng with April, 20th until end of June. Price per person 900 euros. - saturday to monday, starting with April, 20th until end of June. Price per person 1100 euros. - saturday to saturday, startinng with April, 20th until end of October. - sunday to friday, starting with April 21st until end of October. Price per person 700 euros. - saturday to monday, starting with April, 20th until end of October. The programs are hold on a weekly base. The dates are arrival and departure dates, accordingly. During trips on the South side, you will stay in our comfortable, new private mountain hut at 3700 m! For more information about program details, availability and other dates please contact me by email go.elbrus@gmail.com, by mobile phone +7 928 915 67 53 or Whatsapp +7 988 936 40 66. I will be happy to write or call you back, just send me a short notice! Individual expeditions, projects & events. If you want to climb individually and design your own program, if you are planning a private project (for example, a foto shooting or filming session), a special event or expedition, I will be happy to help you with management, support, organization and guiding. We also offer professional logistics for experienced climbers and mountain guides at a fair price. Climbers, who are looking for special attention during their climb and wish to hire a private guide, please feel free to contact me for private guide services. 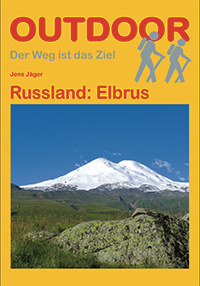 The Elbrus Guidebook in German by Jens Jäger and co-author Liza Pahl is now available in new edition. 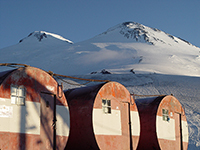 Contents: Trekking around Elbrus on the Northern circuit, Elbrus climb from the South, skiing and freeriding, GPS coordinates, maps, advises for travelers and a small Russian phrasebook. 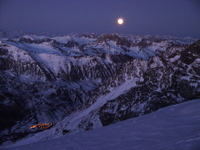 We have designed a new program for you – night ride on Elbrus! The sunny and warm weather that we were expecting on Sunday turned out wet and cold, the temperature during the last nights in Terskol village was only 0 degrees centigrade. And finally today it was snowing below Elbrus middle station (Krugozor station), with the snow line at 2800 m. Usually weather gets like this only in late September or early October. Locals say that this year we will have a very early autumn and a cold winter, which, indeed, almost already has started. Follow our weather news in the next time! This summer in Elbrus Region is unusually rainy and cold. Down in the valley almost every evening we have short, but heavy rain fall, while on the mountain it is snowing hard. The conditions for climbing Mt. 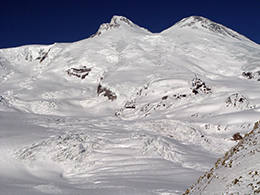 Elbrus are good, as the weather in the morning is usually clear, and all ice and crevasses on the route to the summit are covered with snow right now. Starting with Sunday we expect stable sunny weather, but heavy winds, so it will be cold and maybe difficult to climb to the summit.